Smoking Cessation - Moral Reconation Therapy - MRT® distributed exclusively by Correctional Counseling, Inc.Moral Reconation Therapy – MRT® distributed exclusively by Correctional Counseling, Inc. Smoking Cessation - Moral Reconation Therapy - MRT® distributed exclusively by Correctional Counseling, Inc. The smoking cessation workbook Dying For A Smoke can help any individual who wants to stop smoking, as well as programs and organizations implementing a smoking-cessation assistance program. The workbook is designed to be used individually and in an open-ended group format where people who want to quit tobacco use. The open-ended groups allow new participants to enter at any time. During group, participants can meet, share ideas, lend social support to each other, and make good decisions. 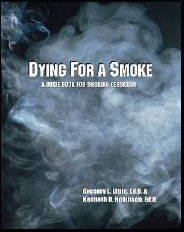 Dying For A Smoke can also be used in private settings, employee assistance programs, and with clients in treatment. There are eight chapters in the workbook. Participants complete the written exercises for a new chapter before attending a group session. The first five sessions are designed to prepare an individual to cease all tobacco use by making an individualized action plan. Session six is designed to be the point when the individual actually ceases all tobacco use or begins the process of reducing use.